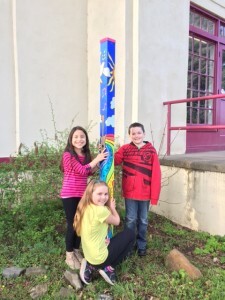 Oregon Peace Pole at Mosier Community School in Mosier, Oregon. A teaching artist from Arts in Education of the Gorge worked with the students to create the design that depicts symbols of peace such as music, a rainbow, a dove with an olive branch, and peace tears. The text appears in English, Korean, Japanese and Spanish to represent the languages spoken by community members in Mosier. Thanks for the opportunity! It was wonderful.